Aqua Sphere AlphaFins isolate the legs to give you a great core, legs and lower body swim fitness workout while improving your stroke form. EVA foam design not only maximizes comfort but also makes the fins float - no more diving down to retrieve lost fins! Water channels provide stability and maximum power transfer. Dedicated right and left fins with full arch support. Made of non-waterlogging, EVA foam. Purchased fins for my 13 year old son. He is a competitive swimmer. Loves, Loves, Loves them! I was so happy to get a set of replacement fins, when my first pair developed a problem. The new fins came in a matter of days, and are even nicer than my previous fins! I continue to tell people at the pool about your website. I am more than satisfied! Thank you for your excellent service! 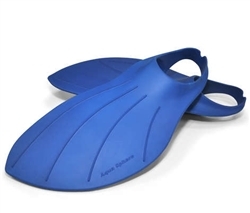 I love my new aqua fins. I use them for lane swimming three times a week. I had seen others using them, and was referred to your website. I have since referred others to your website. I love how they are so light and comfortable.